Planned Parenthood and advocates for women’s health will stage a two-day vigil outside the Governor’s mansion in Raleigh this week. Participants want to pressure Gov. 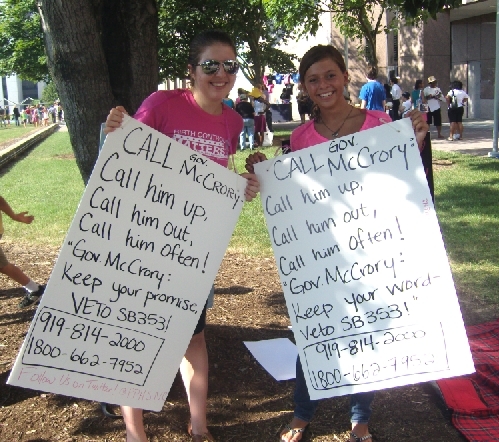 Pat McCrory to veto Senate Bill 353, legislation that opponents say will hurt women and could dramatically restrict access to safe, legal abortion. Last week, the governor told reporters he felt signing the bill that enacts restrictions on abortion would not break an earlier campaign pledge. The vigil will run from 10:00 a.m. Monday to 10:00 p.m. Tuesday at 200 N. Blount St, Raleigh. I just called the governor’s office and the only comments they are accepting is if you oppose or support this so called motorcycle bill. I I OPPOSE IT. I also had the pleasure of telling his staff person that mcrory is a dummy puppet for art pope, who pulls the strings of the entire legislature. Keep up your good work!! What’s wrong with a common-sense law that keeps women safe? Why, nothing at all. But what does that have to do with the subject of this post? It has nothing to do with “keeping women safe”, it has everything to with violating their constitutionally protected right to choose. This is nothing more than another Right Wing fatwah on the rights of women and reason.